Diane and I both lived in Montana and were in charge of running animals shelters. Diane was with the Gallatin Valley Humane Society in Bozeman, Montana, and I was with the Billings Animal Shelter in Billings, MT, operated by the Police Department. We became fast friends as anyone in this field needs a good friend that has been in the same trenches. We traveled together to attend NACA conferences, Montana Animal Care & Control Conferences and meetings of the Society of Animal Welfare Administrators. 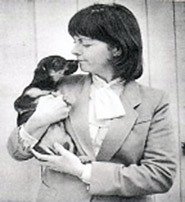 Diane was one of the first females admitted into the then “selected entry” organization – the Society of Animal Welfare Administrators. She helped me to be selected for membership as well. She was eight years younger than me but she looked after me, being much more street-wise than myself. What a great, fun friend. The Diane Lane Award is given to persons who have demonstrated exceptional dedication or performed outstanding work far and beyond the requirements of his/her position – the award requires the same of someone in a volunteer position. These were qualities that Diane championed. Jackson Hole, Wyoming – March of 1975 through January of 1978 Bozeman HS Gallatin Valley – January of 1978 through October of 1983 Everett Animal Shelter, Washington – March of 1986 through August of 1988. You might notice a three year void from ’83 – ’86. Diane needed a break from the stressful life at shelters. Many of us take leaves to readjust and then find ourselves drawn back into this fascinating field. I am included. During that time Diane worked as a real estate broker in the state of Washington and took training in Texas to drive very large semi trucks across country. You would laugh at this if you knew her. Diane was a petite, strikingly beautiful lady – one you would never expect to see holding her own against macho truck drivers. But Diane was a strong free spirit that would take on any challenge. She did drive cross-country until she became ill. Then she went back into animal work. She made tremendous strides at each place she worked to make the organizations stronger and more professional. She was married once to a police officer and I believe she loved him to her dying day. Issues within his family drove them apart but they remained close friends throughout life. Diane never remarried and she had no children. The last visit I had with Diane was when she wanted to see her beloved beautiful Montana one more time and she came to Bozeman. I drove there and we went white-water rafting. No one wanted the front seat as it was the wildest ride and the most at risk position. Up went Diane to the front seat where she enjoyed a wonderful wild ride. We visited her favorite places and took in a rodeo. She returned home and passed away a couple of months later due to cancer. Her ashes were spread in the mountains near Bozeman.